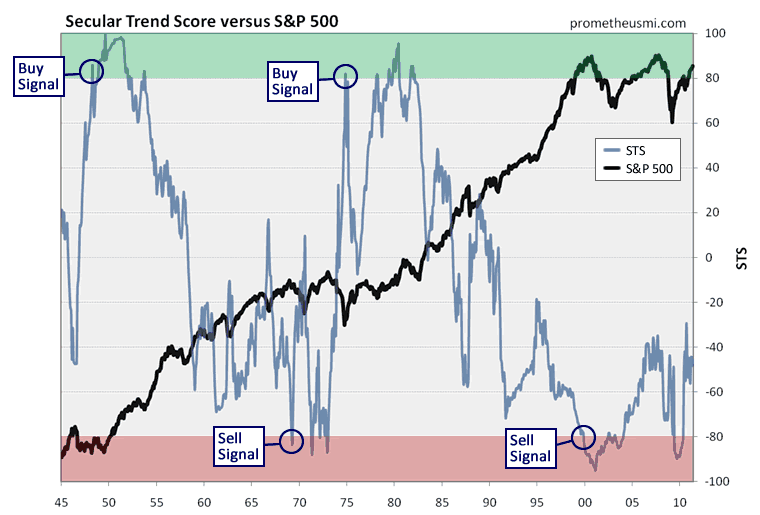 Our Secular Trend Score (STS) [vs. the S&P 500 as shown in the chart below] indicates that we yet to even approach positive territory since the last secular sell signal was issued in late 1999, suggesting that the start of the next secular bull market is still several years away. Highly reliable valuation-based models that forecast future market returns using data such as the Shiller cyclically-adjusted price-to-earnings ratio, the Q-Ratio, long-term price deviations and total return trends [such as the] study conducted by Adam Butler and Mike Philbrick of Butler|Philbrick & Associates, confirm the long-term outlook provided by our STS. 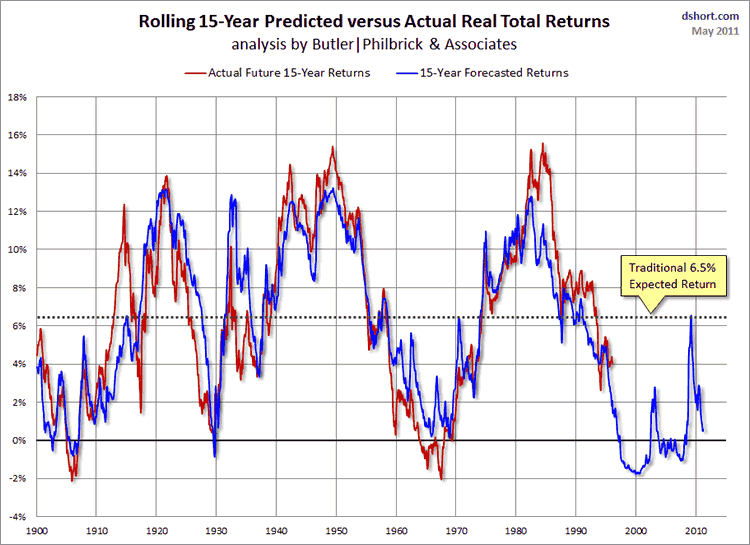 The following graph from DShort.com displays 15-year actual stock market returns and projected returns since 1900 using the Butler/Philbrick model. With a couple of notable exceptions, actual returns have tracked projected returns almost exactly during the past 110 years. Currently, this model projects that stocks will return -0.5% during the next 10 years and 0.6% during the next 15 years. In other words, stocks are likely to produce no gains for the next 15 years. Of course, the stock market is likely to go nowhere in an interesting way, experiencing violent advances and declines as the secular bear market moves into the final phase of its development. However, the fact remains that stocks are priced to deliver historically poor returns as investment vehicles for the foreseeable future. 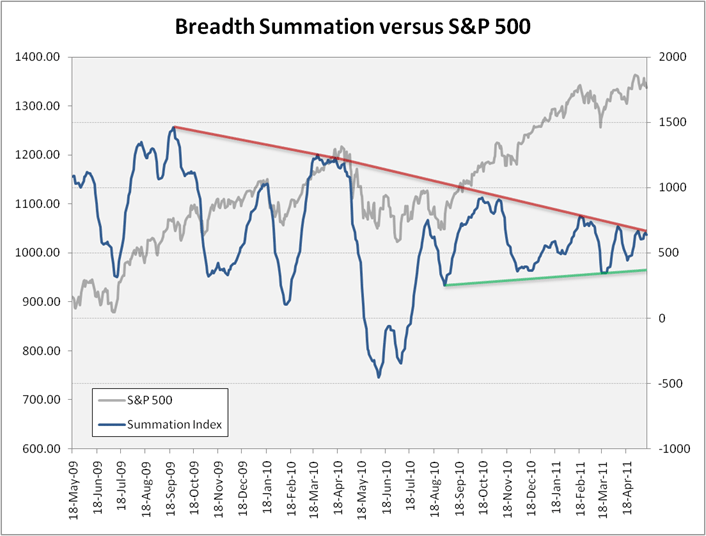 While valuation-based forecasting models project a poor long-term outlook, chart analysis and internal data also suggest that the stock market has entered a period of heightened risk from an intermediate-term perspective. The current cyclical bull market from March 2009 [see chart below] has been an extreme move, resulting in a doubling of the S&P 500 index during the course of 24 months. The rally is now 26 months old and cyclical bulls that occur during secular bears have an average duration of 33 months. 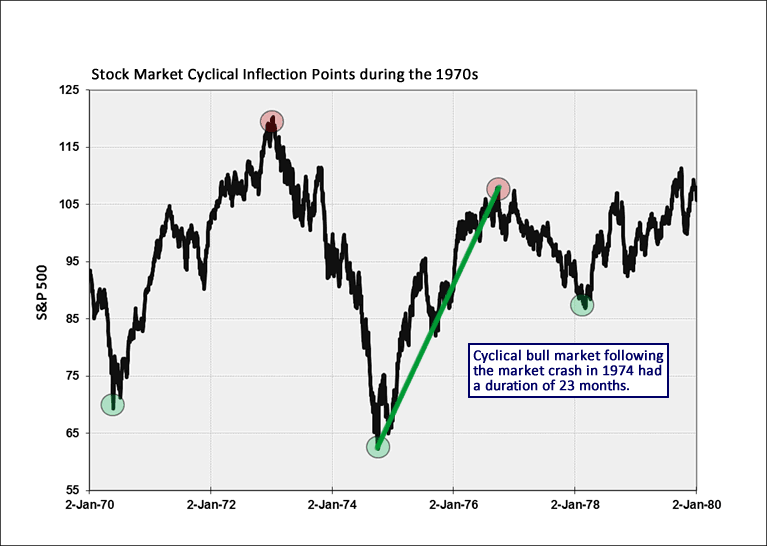 The last cyclical uptrend that followed a market crash occurred in 1974 and had a duration of 23 months [see chart below], so it would not be unusual for the current advance to terminate during the next few months. Additionally, market internals continue to negatively diverge from price behavior, indicating that the rally is gradually losing buying support. 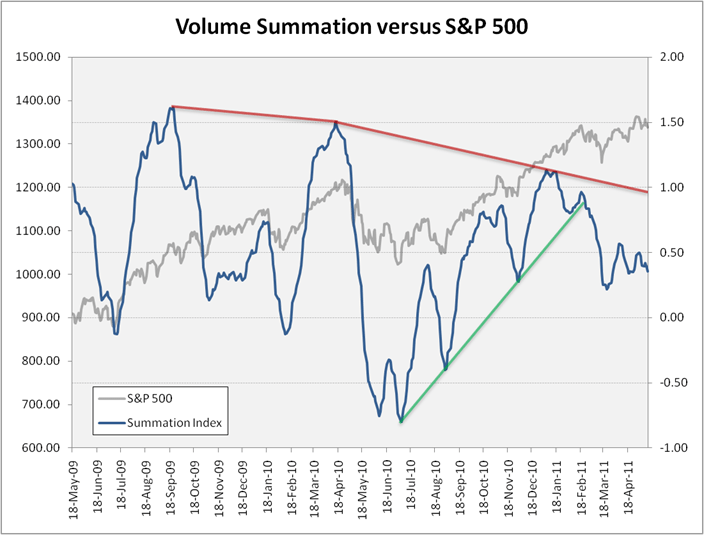 For example, volume summation continues to hold near recent lows following the sharp decline in February and breadth summation has been moving sideways for the past year. 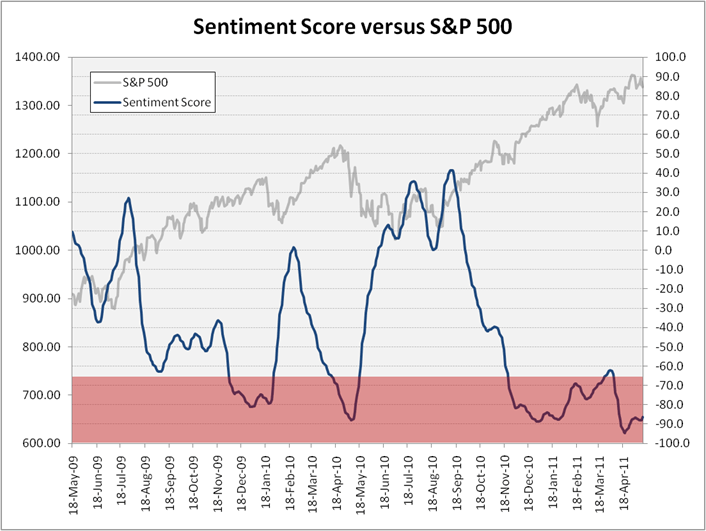 Finally, our sentiment score recently declined to the lowest level since late 2007, reflecting an excessive amount of bullish sentiment that leaves the stock market vulnerable to an abrupt, violent decline. At a current duration of 26 months, the cyclical uptrend has reached the age range within which rallies typically end when they occur during secular bear markets and market internals and sentiment are not supportive of additional gains, so stocks currently offer a poor risk/reward ratio as both investing and trading vehicles. Previous Take a Look: Economic Stagnation is EVERYWHERE! Next World's Silver Production By Country – And Much More!